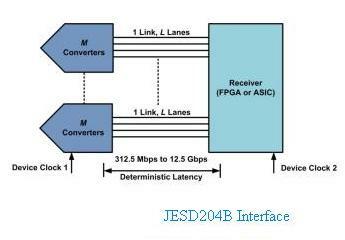 This JESD204B tutorial covers JESD204B interface basics. It mentions features of JESD204B interface, protocol layers of JESD204B interface etc. The JESD204 has been introduced several years ago in 2006. The latest revisions have made it popular over its predecessors (LVDS and CMOS) in terms of size, cost and speed. It is the interface between ADCs/DACs and FPGAs. It can also be used with ASICs. The figure-1 below depicts JESD interface used between converters and FPGA/ASIC. 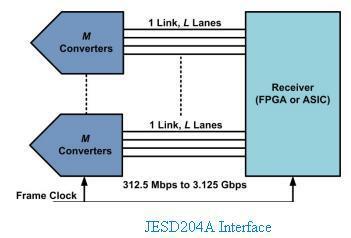 The standard defines multi-gigabit serial data link between converters and a receiver (e.g. FPGA or ASIC). Initially single serial lane between a converter or multiple converters and a receiver has been defined. Latest wireless technologies LTE, LTE Advanced and 5G require implementation of DSP blocks on FPGAs or SoCs. These devices drive antenna arrays to produce multiple beams for each individual subscriber handsets. Here hundreds of megabytes of data per second are transferred between FPGAs and data converters in both transmit mode and receive mode. In this application JESD204 is ideal interface. The other applications include SDRs (Software Defined Radios), Medical Imaging Systems, Radar and Secure Communications etc. The figure-2 depicts JESD204A interface. Following features are supported by JESD204A. The figure-3 depicts JESD204B interface. Following features are supported by JESD204B. The figure-4 depicts JESD204B protocol stack. 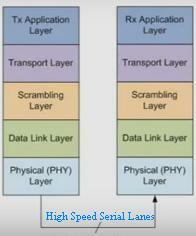 It consists of PHY layer, Data link layer, Scrambling layer, Transport layer and Application Layer. ➨Physical layer : Serializer/Deserializer (SERDES) layer responsible for transmit/receive of characters at line rate speeds. Includes drivers, receivers, clock and data recovery, etc. ➨Data link layer : Encoding/Decoding of optionally scrambled octets to/from 10 bit characters. It handles special control character generation /detection for lane alignment monitoring and maintenance. ➨Scrambling layer : Optional scrambling/de-scrambling of octets to reduce EMI effects by spreading spectral peaks. ➨Application layer: It takes care of various applications at transmit and receive ends.